There is fine line at times between what constitutes a winter waterfall ice climb or an alpine ice climb in the mountains of Alaska. The climbs listed here are what I consider alpine ice climbs because they are associated with a mountain name more than the name of the individual climb. Not that it matters though, just go climbing. The only guidebook for mountain routes in Alaska is "Alaska: A Climbing Guide" by Michael Woods and Colby Coombs. This book is a hot seller and for good reason. The Mountaineering Club of Alaska (MCA) has a web database listing the major peaks around Anchorage with a few route descriptions. The MCA also has a library located upstairs in Alaska Mountaineering and Hiking containing their publication Scree that has information on routes completed by members and a host of other books. If you have questions or require help, please feel free to send an email. Unlike winter waterfall ice climbing in Southcentral Alaska, approaches to many alpine routes can be a major suffer-fest. Depending on the time of year, the local, deep snow, snow covered alder thickets, open alder thickets, devils club, mosquitoes, streams, bogs and animals are all contributing factors. The good news is, climb up, over and through all these inhibitors to above tree line and movement is across open alpine terrain. Bad news is, some approaches require miles of movement through these character builders. But not all alpine routes are suffer-fests. Climbs in the Glen Alps and Portage start next to the road and climbs in the Talkeetna Mountains have nice but long established trails. Fall, winter and spring approaches should be accessed on skis or you will understand the term post-hole. Avalanche awareness is more of a winter thought but not in Alaska. Snow slides, falling cornices and collapsing seracs all happen frequently year round. And, winter conditions with high winds and snow can happen during any month of the year in the high country. Alpine ice climbing in Alaska uses the Alaska Grading scale. This single number rating draws on the steepness, technical difficulties, and commitment and also includes the objective dangers found in Alaska. This scale is used primarily for climbs in the Alaska Range on the great peaks like Denali, Foraker and Hunter but can be found and used on the other peaks throughout the state of Alaska. There are climbs that are given technical grade such as 5.8, AI4, A2 but this is used on routes or specific pitches when those climbers choose to break it all down. Grading alpine ice climbs is even more subjective and more difficult than waterfall ice or rock climbs. And at times, they do overlap and blur, especially on the local alpine climbs. Grade 1: A fairly easy climb primarily dealing with the hazards of glacier travel, weather and mild altitude. Unless a glacier is involved, a rope may or may not be required depending on the experience of the climbers. Grade 2: A moderate climb with no real technical climbing but could involved moderate technical climbing. A rope is required except for the most seasoned hard. Involves high altitude, weather and knife-edges. Grade 3: A hard climb with short sections of steep technical climbing at altitude and corniced ridges. Grade 4: A very hard climb with sustained technical climbing at altitude. Grade 5: A difficult climb with sustained technical climbing with major gain of altitude, retreat hard but possible and bivi sites can be found. Grade 6: A severe climb with sustained technical climbing over 4000 feet, retreat not possible, bivi sites marginal, and entire route subject to avalanches. Glen Alps: There are several snow filled couloirs and a few iced up north faces found in the local mountains just above Anchorage. Access the Glen Alps parking area where an annual parking permit or daily fee is required. From the Seward Highway, take O'Malley Road east up the hill, towards the mountains for those without a sense of direction or compass for about 4-miles. Turn right at Hillside Drive and go about a mile or so to Upper Huffman. There is a Chugach Park sign here too. Turn left on Upper Huffman and go up the hill for about three-quarters of a mile till reaching Toilsome Hill drive on the right. State road maintenance ends here so the road can be very slick and icy on this steep narrow twisty road. Coming back down can produce white knuckle on the steering wheel syndrome. Drive till the Glenn Alps parking area is found on the left. This is a high vandalism and theft area so do not leave anything of value in plain sight in your vehicle. Ptarmigan Peak, grade 1, 1000': A 40 degree snow couloir on the north face of the peak. While not hard it has been the scene of several accidents. Make sure you know how to self-arrest. It has a real threat to avalanche. From the Glen Alps Trail Head, follow Powerline Pass trail till under the Col, about 4.5 miles. Riding mountain bikes and stashing them in the brush is very common and fast. It is best to walk off the back side and traverse north to the wide notch (Ptarmigan Pass) between Flaketop and Ptarmigan. Mount Williwaw: This is the massive pyramid shaped peak at the head of Campbell Creek. The NW face of Mount Williwaw is reported to have a serious alpine ice climb. Details are sketchy to nonexistent. Suicide Peaks - North and South, grade 2, 1100': A 4-mile approach up valley from the parking area to Rabbit Lake. There is an access issue with private property so pay attention and do not spoil it for all. The north faces of both these peaks stand tall with alpine mixed terrain but South Suicide is superb. The area is known for horrendous weather. The potential for a new line is great but beta from most who have ascended the north faces of these peaks is nonexistent. Crow Pass: Glaciers and many summer filled snow couloirs at the pass and down trail over the pass towards Eagle River Valley. Drive the Seward Highway south to the town of Girdwood, 35 miles from Anchorage. After about 2 miles from the Seward Highway turn left onto Crow Creek Road. Follow this narrow gravel road for 5 miles reaching the bridge. Turn right onto the even narrower road and head up hill to the parking area hoping you don't meet another vehicle. Access Crow Pass trail reaching the old mining ruins. Stay on the main trail till above the ruins where you cross the creek that spills into the large waterfall beside the ruins. Either follow this creek till reaching the Valley of Jewel Glacier or stay on the steep trail until reaching the cabin and finally Crow Pass and Raven Glacier. There are a host alpine climbs in this area and the alpine setting is awesome. Jewel Glacier, grade 1, 500': After crossing the stream above the falls, head to the upper plateau by paralleling the stream. Gain access to the glacier and climb up 40-50 degree ice to the ridge and ice cap. Crow Glacier: From the cabin at the pass, circumvent the lake and follow the glacier melt stream to the tongue. A good area for trekkers and summer ice junkies. A beautiful campsite with small tarn can be found just above the long moraine finger used to access the glacier. Raven Peak: About a mile from the cabin, gain access to Raven Glacier and head straight up glacier. Either climb the headwall on the left or continue straight up to Eagle Glacier Ice Cap. Go north for Raven Peak and south to South Raven Peak. Glacier Gulch, grade 2/3, 1200': Found at the narrow bridge in the road to Crow Pass Trail. Access to this route is from the faint trail which is located about 100 yards from the narrow bridge once you are on the one-lane dirt road to Crow Pass Trail. Hike through tall grass as the trail traverses right. Climb straight up the glacier towards the notch in the ridge. The top has several hundred feet of 60-70 degree glacier ice / snow. Portage: Several excellent routes in glacier terrain but watch the weather. Middle Canyon Glacier, grade 2, 500': A superb ice route straight up the face of the glacier with several hundred feet of 60-degree ice. You most assuredly will gather a crowd below. Byron Peak, grade 2, 2000': This glaciated peak at Portage has all the thrills of bigger Alaska Range peaks. Climbing up the heavily crevassed left side requires expert glacier travel skills and a bit of insanity. A superb route takes the line straight up the center of the peak, a pitch of 5.6 rock to 50 degree glacier ice to the schrund. Cross the schrund (very difficult) and climb the 70-degree ice on the steep face under the summit. Mount Ascension, grade 1, 1200': Twelve miles north of Seward or 110 miles south from Anchorage, take the Primrose Lake / Campground exit. Park near the lake and access the trail head. Bypass the the lake and pick your route to the summit on rock, snow and glacier terrain. Eagle River: Located 12-miles up Eagle River Road from the town of Eagle River, the area is better known for it's alpine routes than ice climbing. Polar Bear Peak, NW Face, Grade 2, 2500�: From the Eagle River Nature Center, hike 6-miles to Icicle Creek, cross the river and head up the valley trending left. Climb straight up the face on mixed terrain to the cirque glacier just below the summit pyramid. Descend by the ascent line or by the SE Ridge. Eklutna Glacier: Rugged peaks with easy and hard routes, and some are still waiting a first ascent. This area could fill a small guide book. Access along the 13-mile lake side trail. Watch for motorized vehicles. There is a newly constructed hut for out of the weather camping. Gain access to Eklutna Glacier, after about 2-miles follow the west fork to an area of superb alpine climbing. Eklutna Traverse: While not a climb, this 38-mile glacier traverse over White Out pass that ends at Raven Glacier or Eagle Glacier should be on anyone's tick list. Gain access to Eklunta Glacier and follow maps to your intended goal. Three huts along the way for shelter. Watch the weather and know map-reading skills. Not uncommon to spend several extra days waiting on the weather. The traverse also contains many peaks to climb along it's way and many more to climb off Whiteout, Finch, Sparrow and Pipit Glaciers. Pioneer Peak, N Face, Grade 2, 4500�: Take the Glenn Highway north to the Palmer Alt / Old Glenn Highway and drive to the base of the large avalanche slope debris area and sign, just before the bridge across Knik River. Follow the main avalanche gully until reaching rocks where the gully narrows at around mid-height. Above this is more snow slope until just near the top there is a left angling ramp and the angle gets steep until the rocks to the summit are reached. Descend by the East Ridge until reaching a large snow slope that will take you back near your vehicle. Talkeetna Mountains: The Mint Glacier area has some of the best potential for alpine ice climbing in South Central Alaska with Troublemint Peak the star. Take the Glenn Highway to just past Palmer, turn on FishHook / Willow Road to the Mother Lode Lodge. Take the Mint Trail from the Mother Lode Lodge for 9-miles, traverse around the knoll to the left and up and down to the hut and camp. Pay heed to avalanche conditions here. The hut is not for public use but the area has good camping spots. Linear Accelerator, Grade 3, 5.6, 1000': Weave up the Mint Glacier heading for the steep ice line up the face to the col right of the summit. Climb the rocky ridge to gain the summit. Troublemint Peak, East Ridge, Grade 2, 5.5-6, 1000': A long snow gully with alpine rock near the summit ridge. Matanuska Glacier: The area has plenty to offer with altitude, isolation and weather on glaciated peaks. Take the Glenn Highway for 100-miles. Awesome Peak, S Face, Grade 2, 2500�: Start in the main snow gully that seems to end in a rock band at mid-height. Climb the crux ice then up lesser angle snow, trending right until the ridge, just right of the main summit. Amulet Peak, N Face, Grade 3, 3000�: Start in a wide nondescript east leaning couloir that eventually narrows and gets steeper directly up the North Face. Near the top, head for two large rocks and climb between them. Descend by ascent route or traverse east and down the East Ridge. Sergeant Robinson: Fifteen miles up Glacier Creek is this massive mountain. There is an unconfirmed grade 4, 19-pitch alpine ice route. Panorama Peak, grade 2, 3000': Located at milepost 217 Parks Highway, this 60 degree gully of snow and ice climbs up the south face and is a true delight. Tops out at the saddle about 300' from the summit. The Big Routes: The big peaks of Alaska produce some of the finest alpine ice climbs in the world and are the climbs dreams are made. While many of these routes are becoming populated and the commitment level falling, these are still dangerous climbs in a remote alpine setting. All climbs are accessed by bush planes and start from Talkeetna, 130 miles north of Anchorage. High Ice Ak uses and recommends Doug Geeting Aviation for air taxi service. Getting from Anchorage to Talkeetna requires more heartaches but there are several van lines running between Anchorage and Talkeetna. The skills you must possess before venturing out into the ranges of Alaska include glacier travel and avalanche awareness, and it is wise to understand weather. Once there, you must possess the many hard-earned skills of alpine climbing. To aid in the success of your climb, efficient winter camping skills and a good head game to deal with the weather will help increase your odds. The distances are long and the snow deep, and a good set of skis will make traveling more easy. Never venture from camp without crevasse rescue gear and a pack with surviva gear. I have witnessed more and more climbers doing just this and the Ruth Gorge being the most predominant. Seems many are losing their respect for this dangerous alpine setting as the masses gather and assumed safety closer. Ruth Gorge: Commonly referred to as the Great Gorge, this 8-mile long gorge of ice and rock has spectacular alpine ice climbing. Climbing here is big league but some of the popular routes are becoming trad routes from the congestion and the level of commitment is decreasing on these routes. Local Alaskan climbers are turning a few of these alpine climbs into weekend ice climbing trips. In fact, two years ago, snowmachine tracks were seen in the Gorge ending near the icefall of the Tooth. The common area for basecamp is between Dickey and the Moose�s Tooth but it�s wise to camp near the Tooth side of the glacier as Dickeys steep walls and hangers can produce large avalanches. The weather is mild compared to the other parts of the Alaska Range and it can rain during the winter months. Deep in the gorge receives little sunlight but during the day, temperatures in the sun can soar to 60F. The dark gullies and shadows of the gorge do remain bitter cold. The wind can blow at a constant breeze but rarely does it rage like the higher altitude giants. There is a band of rotten rock running the entire length of the gorge and when viewing from below, its quit obvious. Moose�s Tooth: This giant produces two superb gullies of ice on its south face. While these are superb, recent exposure to the masses and congestion of this area has lead to reported lines forming and climbers having to wait their turn. Not as bad as that description but the solitude once known here is gone. The Tooth has transformed from a fine alpine setting to resembling something in trashy Europe. Some climbers land at the 7200� level under the south face (The Tooth Canal) and make these two ice routes a weekend ice climbing trip. The customary way is to camp on the Ruth Glacier which can mean gaining access to the 7200� level through the icefall, avalanche bowl or the meekly protected snow gully (has fixed gear now thanks to Chris Davis) that can be the hair raising crux. 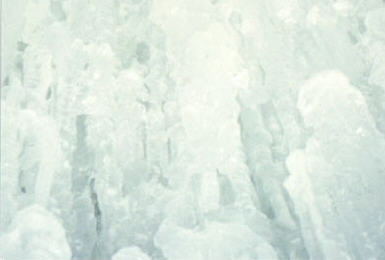 Hamm and Eggs: Long stretches of 50 degree snow inter-sped with pitches of ice which can become very rotten. The crux pitch is mid-height but in lean times a few moves of 5.7 on wet rock must be made at the base to reach the gully proper. Approach into the route from climbers left, traversing right. There are 18 fixed anchors now and as the traffic increases so will the trash. Shakin Not Stirred: More sustained ice than its neighbor and a full grade or more up in difficulty with two cruxes, a steep ice pitch at � height and at � height there is a chockstone that only the most committed will scale. The rock in this gash is monolithic but as the traffic has increased, there are now several fixed anchors. Gargoyle: Standing at the Gateway to the Gorge, this hunk of granite has three gullies of snow and ice located on its south east face. Major routing finding through the lower icefall to reach the gullies can be the crux as is descending. Dickey: Located in the col between Dickey and Barrille hangs a huge 800� fang of ice that forms off the ice cap. Climb avy slopes in the col between Dickey and Barrille to reach a band of rock, climb the band on 5.9 moves to the base of the fang. Get hard and climb the fang of ice traversing left near the top and then climb through the summit ice cap seracs. There are several more lines of ice to the right in this area. It is unknown about them but looking across at them they would be a step-up in stiffnes and commitment. Barrille: The Japanese Col is a moderate gully of 55-60 degree neve snow and at times ice can be found. Stay climbers left in the col and use the fixed gear. Their is a splinter gully in the main gully, climbers right that offers a different and slightly stiffer variation to this route which ends and connects back to the main gully near the ridge. A fairly stiff traverse at the top to reach the moderate snow slope and then the summit. Descend your route. Around � way up the Japanese Col just before where the main gulley splits, there is a gash on the right side that leads to just below the summit but the commitment on stiff mixed terrain will leave most gazing. Bradley: On the NE Shoulder, climb two pitches of moderate ice, turn left and scratch up a pitch of mixed to reach a stiff runnel of ice/mixed. Climb this runnel until? Either rap the route or if finding the ice connected to the summit, pick your way down the ridge of Bradley, turn right towards Pitock Pass and descend the slot filled slope of the Bradley-Dickey Col. Peak 6700: A work in progress but viewing from below the runnel of ice looks superb. A few wide open slots on approach means moderate route finding to reach the initial snow cone. Huntington: Argumentative the most inspiring peak in the whole Alaska Range, the west face possesses an exceptional ice route. The Tokositna Glacier is an area known for engineering its own weather which can be on the miserable side of dire. Climb 60 degree ice through two rock bands until meeting the super gash. Climb the gash using many fixed anchors with one huge loose flake staying right until meeting the Harvard Route at the ridge. A good bivy spot can be located here for those who cannot push on to the summit in a single push. Continue on up the snow and ice slopes traversing more right the higher you ascend. While it is an exceptional route, this is another route that is collecting trash as the masses migrate here but not near like Hamm and Eggs. Thunder Mountain:Another work in progress with several hard gullies of ice and mixed. Kachitna Spires: This remote area south-west of McKinley is for the most committed. This is one of the last bastions of a true alpine setting in the Range. The routes are not easy, the weather worse than any other part of the range and if you find yourself wanting this region, get large and hard. Sunrise Spire: This gully of ice on the north west face is probably the finest ice route I know. While not technically hard, the bulletproof blue ice is hard to compare with any. Some 5.7 mixed terrain is required at the top to gain the summit.